The pillory was an ancient punishment and as early as the 13th century it was used for traders who had swindled the public. After 1637 it became the recognised punishment for those who published books without a licence or libelled the government. The most famous pillory in London was at Charing Cross. When the public disagreed with the verdict of the court they turned the event into a demonstration against those in power. When Daniel Defoe was pilloried in 1703 for libel, the crowd covered the pillory in flowers and gave him an ovation when he arrived at Charing Cross. 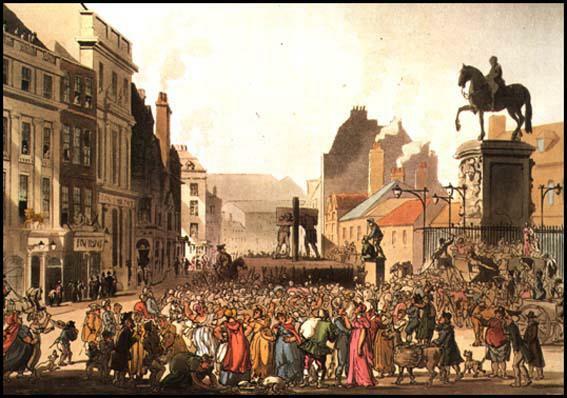 The plate is a representation of the Pillory as it appears in Charing Cross, a place very frequently chosen for this kind of punishment, probably on account of its being so public a situation, and having so extensive an area for the spectators, who never fail to be drawn together by such an exhibition. The degree of punishment depends very much on the nature of the crime. There are some offences which are supposed to irritate the feelings of the lower class more than others, in which cases the punishment of the Pillory becomes very serious.